Do you believe in working hard and staying true to your word? Then it sounds like you'll be right at home in House Hufflepuff! The students and teachers that wear the yellow and black colors of Hufflepuff may not be as daring, ambitious, or cunning as the other students at Hogwarts, but they will always do their best. Plus, their mascot is a badger, which can be way more formidable than a lion, snake, or a raven if you catch one on a bad day! 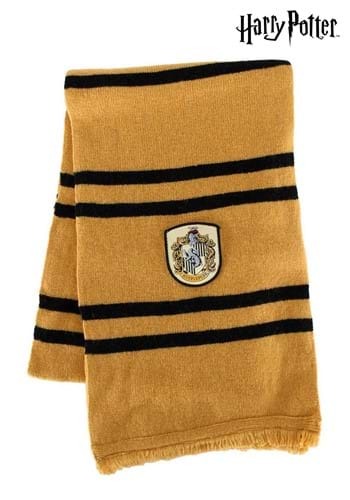 Show your dedication to your favorite house at Hogwarts with this official Hufflepuff Scarf! This cozy wool garment looks just like the ones worn by members of House Hufflepuff in the Harry Potter series, and features the official crest and badger of the house stitched on the sides. Wear it with the matching Hufflepuff Hat to keep the chilly air away faster than any warming charm!